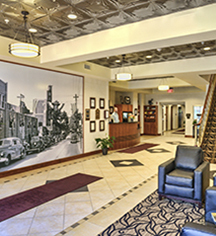 Hotel Warner is ideally located in historic downtown West Chester for business meetings, social events, and weddings and receptions. With on-site and nearby off-site spaces, the hotel can accommodate from 40 up to 200 guests. For smaller, intimate events, Hotel Warner’s on-site meeting space is semi-private and can accommodate up to 40 guests. It is available daily after 11:00 a.m. Located across the street from the hotel, the Chester County Historical Society has several meeting and event spaces to accommodate cocktail receptions, seated dinners, classrooms, birthday parties, and business meetings. The Auditorium is located on the second floor and the largest event space in West Chester at 2,600 square feet of convertible space. It can accommodate 300 guests for a standing/cocktail reception, 250 guests in theater style, or 180 guests for a seated dinner. The Classrooms, located on the lower level and third floor, have either a white or blackboard and accommodates 10 to 20 guests. The Conference room, on the second floor in the Administrative Office Wing, has a whiteboard and can accommodate 12 guests. The High Street Terrace is a perfect outdoor location for cocktail receptions and can accommodate up to 30 guests. In addition, admission to the Chester County Historical Society Museum, Library, and Museum Shop is complimentary for attending guests. Around the corner and within walking distance from the hotel, the Chester County Bar Association offers several meeting spaces for events. The Lower Level room can accommodate 70 guests in classroom style and 128 guests in theater style. The Upper Level room can accommodate 84 guests in classroom style and 98 guests in theater style. Smaller venues, such as the Wade Room (4 guests), the CCBA Library (8 guests), and the Board Room (20 guests) are available for business meetings and events. Shuttle transportation to and from the hotel can be arranged for event groups to local establishments. 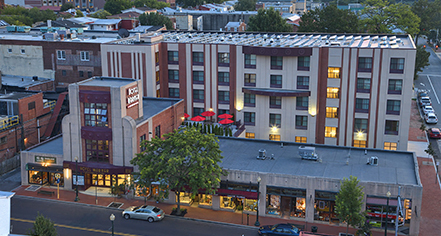 Hotel Warner partners with many of the local venues, restaurants, and businesses to produce a memorable event in historic downtown West Chester.